The 2016 Ford Fusion is a very attractive mid-size sedan. Whether it is on the inside or the outside it encapsulates style, efficiency, technology and value. The Ford Fusion offers something for basically any driver out there including performance, handling, luxury, functionality and luxury. Even after a few years of production the current build looks as fresh as ever and ready to go. The vehicle is very spacious with ample amounts of space and storage. It is not hard to see why the Ford Fusion remains a very popular vehicle selection. Its ratings and public favor are only improving as the brand looks toward the future. 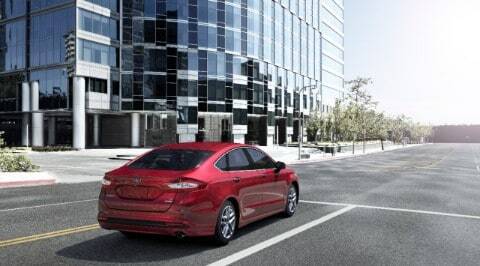 The Fusion has a few engines to choose from including an inline 4 cylinder that is 2.5-liters and gives 175 horsepower and 175 lb.-ft. of torque, there is also a 1.5-liter EcoBoost inline four cylinder offering up 181 horsepower and 185-ft. torque this is a great performance for the price. Other options include a 2.0-liter Ecoboost inline 4 cylinder with 240 horsepower and 270 lb.-ft. of torque which shifts great because of paddle shifters. There is also a six-speed SelectShift Automatic transmission. In all versions the motor and transmission really work in harmony producing a great driving and handling experience. The powertrain is both nimble and eager which is not necessarily what you always find in sedans. The ability to get all-wheel drive has been expanded this year to all models and the fact that the vehicle drives very light will also help in the overall driving during any conditions. The interior of the Fusion is extremely well made with vibration stopping and noise minimizing technology. This year's model has a bit more leg room and more firm front seats also help in the comfort department. There is also great storage space within the interior. The current design has been in production for several years and the current build is catering more towards the driver and passengers and their ride. The exterior takes a bold and fresh stance along with a hexagonal grille and a mildly arched roofline. The LED taillights also make the Fusion highly recognizable. Can you help me finance my 2016 Ford Fusion? This sedan is full of many features that help keep the occupants safe and secure. There is a rearview camera on all models with sensors at the rear of the vehicle to help you backup. The roof is designed with skinny pillars allowing more of a full view backwards also. All models of the Fusion come with eight airbags including front and side and airbags for the people in the front's knees. Bluetooth hands-free technology as well as head restraints are also featured. There is also new technology on the Fusion which is rear seatbelts that can be inflated and has been starting to be integrated on some Ford models. There is electronic stability control, post-crash alert systems, and a LATCH system for small children, In government crash tests the Fusion receives an overall grade of five stars and a top mark of "good" from the Insurance Institute for Highway Safety. The Ford Fusion is an excellent car and is more than worthy for a spot in your driveway.